Maisy's trying to get home, but unfortunately she has an allergy to bee stings and pollen. Can you get Maisy through the maze without meeting any bees or flowers? 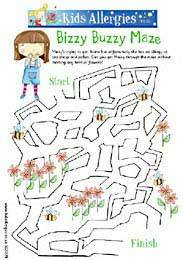 Why not Download the Busy Buzzy Maze and see if you can help Maisy get home. This activity is aimed at 4 to 7 year olds, it's a fun way to raise your child's awareness of allergies and build their problem solving skills.